My senior parents just moved to Vancouver and we were surprised at the low number of Thai restaurants and none in their immediate neighborhood. Luckily this one had good reviews and was the closest. 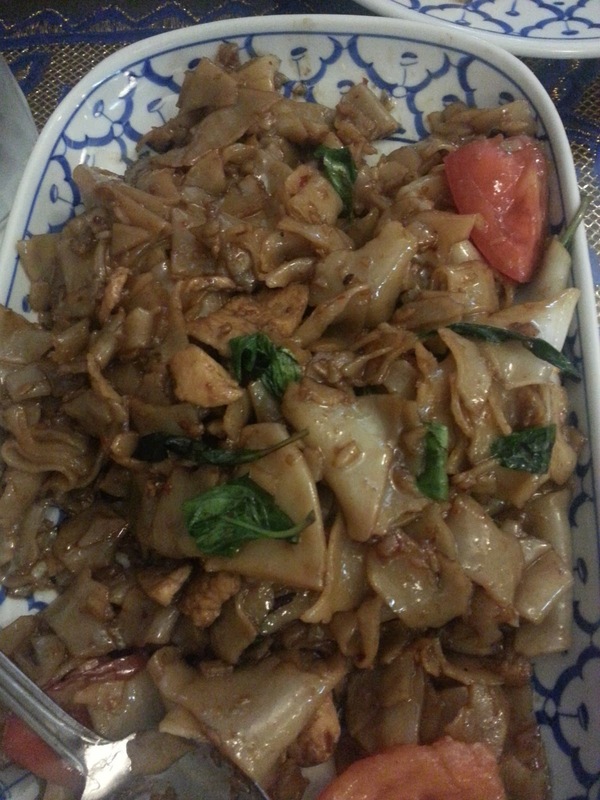 Dok Koon is found in a residential area called Minnehaha and is in a small strip mall. It's definitely isolated from competition of any restaurant sort. We entered to a very friendly greeting and were seated at a booth. The place is a medium sized restaurant and had a constant stream of customers. The service was decent, but a bit slow at times, especially with our green curry. The menus were interesting in that they did not even bother with using Thai names for the dishes. 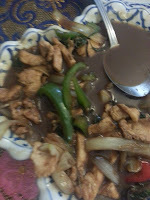 The dishes were just named by the main component: Basil, Ginger, Green Curry, etc. 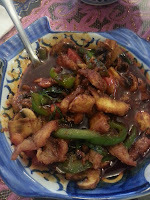 We ordered the drunken noodles, spicy crispy catfish, green curry, and basil chicken - all medium hot. Even so, I found them to be on the lower side of medium hot. 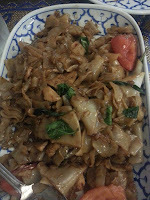 The drunken noodles came out first and the order was very large. We enjoyed them, but I would have liked a bit more chicken. The catfish was our least favorite. My dad commented that you could have been eating on bits of leather because you couldn't taste the fish at all. Although, this comment sounds harsh (leather? ), I found that the catfish pieces were, indeed, crispy, even though in a sauce. So I found it was cooked well to its name, but didn't care for the sauce as much, which my dad is saying overwhelmed the fish. They enjoyed the basil chicken the most. This was definitely cooked as mild hot, not medium, and probably was better for them. (Dad has lost some of his spicy hot taste buds over the years it seems.) Basil chicken is how I judge all my Thai restaurants and I was disappointed in the lack of basil. I suppose that could be due to the season (winter) as even I have a hard time finding basil in the stores sometimes. Even so, this dish is supposed to have a lot of basil and it was a bit sparse. The last dish, and I mean very last, was the green curry. It was very late and if my folks had been by themselves they would have canceled the order because they were now full. Myself, I had ordered a lot since I wanted leftovers for lunch the next day. (New house still not unpacked.) This dish came out a good 20 minutes after all the others. It didn't seem like they had forgotten it as the servers kept mentioning that it was on its way. But come on, green curry is a main Thai restaurant staple and should have been a mere matter of adding the protein of choice, veggies, and sending it out. When it did arrive I commented on how bright green it was, the brightest I've ever seen. The waitress said it was due to the spinach. There were no spinach leaves, and pureed spinach can often turn things muddy brown, so I'm not sure how it was added for color. We ordered ours with prawns and found that there were two per person. A few more would have been nice. Still, a basic green curry. The check came with a choice of Hershey's Kisses or sticks of mint chewing gum. As we left a young couple told us that they had been going there for four years and loved it. They warned us that hot was indeed hot. 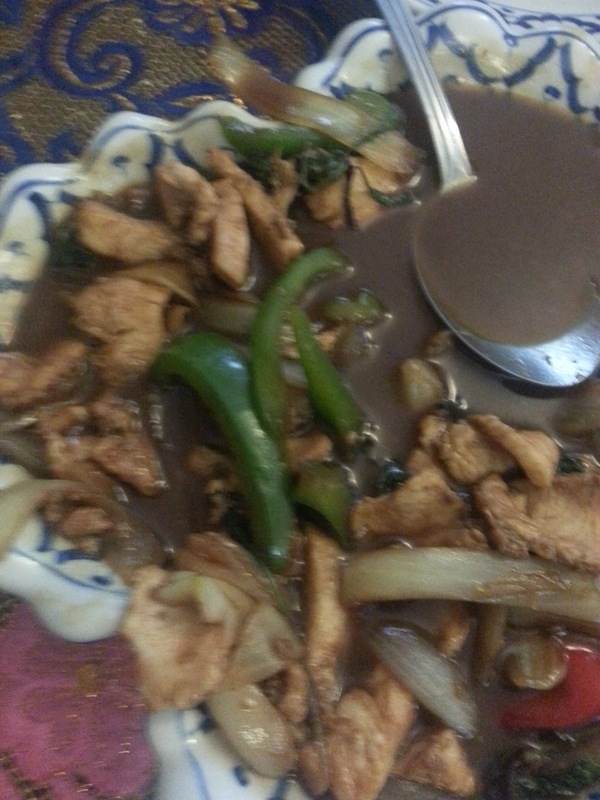 I think my folks have found a good, basic Thai restaurant that they can rely on. Not outstanding, but pretty average.